this Brigadoon/semi/DisneyLand we call home: five people ram-dumbly attacked in town last night…2 outside El Muro, one outside dos Reilly’s, one on 6th calle somewhere and the last? a guatemalteco who lost a lotta blood and an ear…one of Ocelot’s bartenders stabbed…no, not Camilla or Carla…that would’ve been cause of a public lynching. four of the five were auslanders…one a Canadian, the other an Aussie…perfecto…first the ATM problem, which hasn’t stopped(BAC/antigua and the ATM at the Hotel Antigua this week)….looks like I’m personally gonna take proactive measures tonight…no, that bulge doesn’t mean that I’m happy to see you..where are the cops? where’s Adolfo? where’s this ‘mano duro’ stuff? gotta wonder about the mind-set of the two assailants…drugs? more than likely…alcohol?…that’s a given…sounds like a bad PCP binge to me…not a lot of acid around and yeah..blow? yep…some kinda gang initiation ritual? 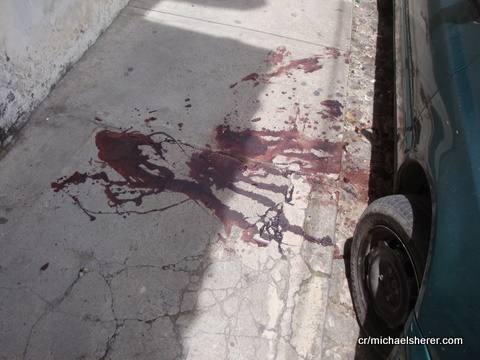 has Antigua become the new Acapulco/Juarez? one thing I am doing tonight….El Caminante’s Burlesque Show…featuring Lucy the Luscious, who’s become one of local FaceHole’s most popular ”friends’..jeez…whata week and it’s only Fried Day…’got the news/scoop from Robto De Oro re Edwin Chavez/and the missing diamond scales he ‘borrowed’ a year ago…they somehow ended up ‘on the river’ in Frank’s possession…the bad German version of Jack Palance…Ed, as usual, doing his verbal acrobatics…’should been an attorney, because you know when he’s lying…his lips move..thanks…a week of WTF? yep, you’d think I’d have known this…gotta stop channeling Polly Anna..no news(same story, different day) of the less than great Antigua Shooting Range…one wonders, one does..
and..there might just be good news re the Salty Beaver…shur as hell hope so..this hasn’t been a week of any kind of good newz…o please, let Lucy show up tonight..i could use some serious T&A..diversion, entertainment…I’ll keep you abreast of events…later..